The Mystery: What's the story with the stained glass in the bathroom? And while were at it, who was "Cherry Roberts?" 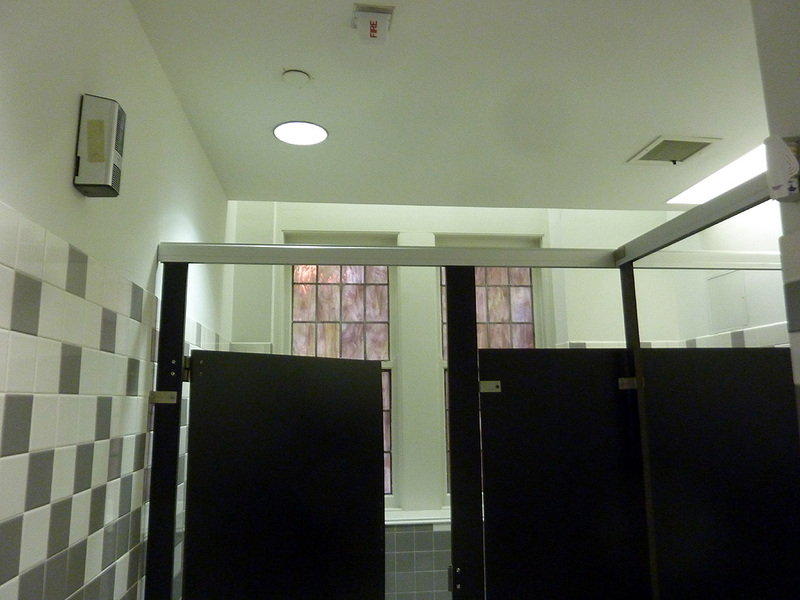 This is the men's room in Lowery Hall at Oglethorpe University. I don't think this is the original 1929 bathroom, do you? Is the stained glass original, part of the 1991 addition, or what? In any case, this is a good look. Four "old" buildings are Oglethorpe trademarks: Hearst Hall 1915, Lupton Hall 1925, Lowry Hall 1929, and Hermance Stadium 1931 all by Mordan and Dillon all in blue Georgia granite. The blue granite shows some beautiful pinks, to my eye anyway. This is the Lowry's front door. It faces into the quadrangle. I was keeping my eye peeled for the Atlanta Glass Project and noticed. Was there a chapel back there? If not a chapel, what? Did they add the stained glass during the renovation? I raced to the other side and found a bathroom instead of a chapel..
See? The ceiling stops short of the window wall. They left space for the 4 upper lancet windows shown here on the outside. Help us solve the mysteries of the glass and Cherry Roberts. Thanks to Dr. Paul Stephen Hudson, Oglethorpe, and the Atlanta Preservation Center for the 10th Phoenix Flies tours. 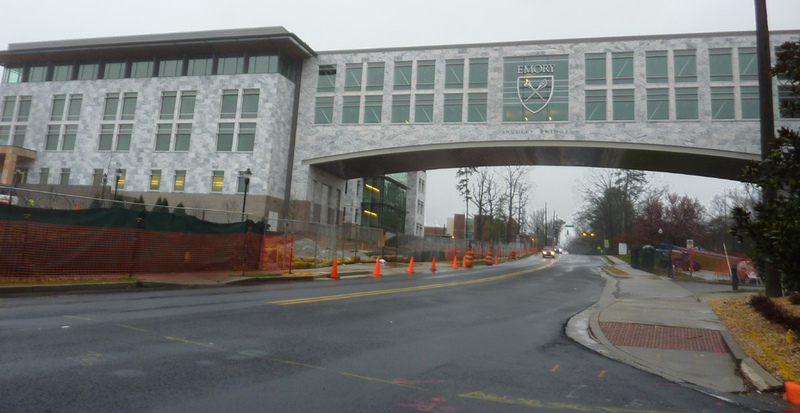 Here are my pictures: "2013-03-22 Oglethorpe University tour for Phoenix Flies Atlanta Preservation Center"
This bridge leads to the stunning new Health Sciences Research Building at Emory University. In the following picture the labs are on the left, the hospital on the right. Steve Lange, Capital Planner for Emory University, gave me a tour on March 7. I'm in awe. It was finished, folks were cleaning up and working on punch lists. I felt like I needed to remove my shoes. It's full of laboratories and lab support facilities. It was immaculate as it will never be again once the labs crank up. I asked Steve if this is good old Georgia marble. No. The white and pink marble and the granite are from Portugal. Ponder that. Though the stone is from Europe, the building meets Emory design standards: marble clad, clerestory-look top floor, overhanging roof, Ludowici Roof Tile. I'm not sure they could build the Canon Chapel today. We visited the penthouse. From here you can see red-roofed Emory Buildings. The glass curtain walled building belongs to CDC not Emory. There's a walkway on the south edge of the bridge, the rest is flexible office and meeting space. Steve said the architects specified 9 different gradations of the white marble. They settled for 4 grades. Can you imagine the aesthetic puzzle of mixing the marble on this scale? Someone with the "eye" needed to select the right block for each space. How'd they do? This is the Penthouse home of the mechanicals, water recovery, heat exchangers, nasty stuff HEPA filers. The labs will be home to some knarley chemical and biological materials. The infrastructure has to keep the power on, the workers safe and the nasty stuff contained. It's beautiful up there. I love those mechanical engineers. The clay tile is decorative. This panel is vertical. I'm looking straight up. Here is a view looking north from the bridge from behind the world's largest Emory sign. I'm on the second floor of the bridge. I was right behind the "R."
From the bridge looking SE on Haygood Druid Hills High School is on the left. See the school busses? I'm unable to convey how beautiful and light-filled it is inside. Here are some aerial construction pictures. I remain in awe. Thanks to Steve Lange and to Emory for look inside. Six Grant Park Windows from the outside. I took a few pictures of windows at my Grant Park Tour for the 10th Phoenix Flies. 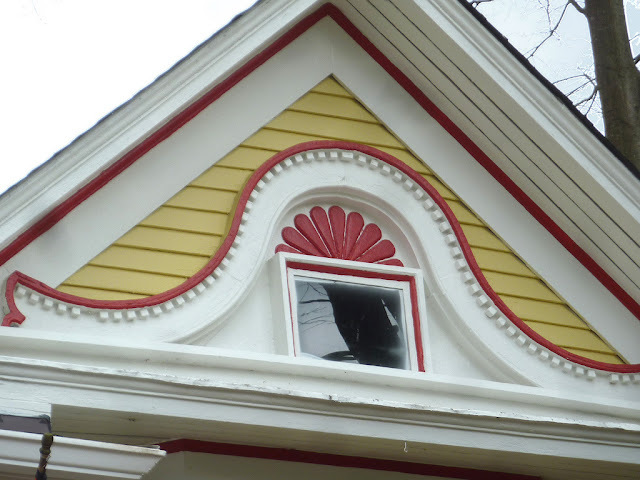 What is there to say about this gable, except that the glass probably isn't original equipment. This is on east side of Grant Street. This is the bottom section of a south facing sacristy widow at St. Paul Methodist Church, a decorative window for a sacred space. Here's the whole window. The the top part is protected by plastic and makes a mirror image. The interesting thing is that you can't see the whole window from inside. They've paneled over the bottom part of the windows. The top window sits in deep reveal with a blind arch. It's a good look. Aged is a good look. Wavy glass is a good look. "Union Capt. James A. Burns began building the large Queen Anne-style home after the Battle of Atlanta"
This one on isn't very prominent in daylight. But a little Photoshopping reveals the butterfly and flowers. Imagine this from the inside. A nice transom trimmed in green. There are so many more. Keep your eye peeled and let us know at Atlanta Glass Project. The 10th Phoenix Flies continues through Mary 24, 2013. See you? It took my breath away and I'm still smiling about it. This is my favorite bathroom over the last 52 weeks, maybe longer. It is so un-vintage, so un-trendy, so corner-windowed. Is rustic the right word? Quirky? Unpredictable? It's hard for Architecture Tourists to resist open houses and caravans. We exploit the real estate industry for our entertainment. Jim Getzinger knows this about me and I'm pretty sure he likes houses as much as we do. It's a triplex close to Taco Mac's in Virginia Highland for sale by the Getzinger Group. Here's the master bath of the whole-floor 2/2 apartment in a 1920 bungalow. Whoever renovated it, AGP Properties I think, deserves a gold medal. This isn't the 1920's bath. It might have been the porch, or the kitchen, or who knows. This is my picture. I'm standing in the closet looking toward the southwest corner showing the amazing light. I'd move my office in here. New bathrooms these days are spectacular and magazine-ready with acres of space. They are amazing but predicable. They tweak the finishes and details depending on whether the owner has "arrived" or "really arrived." I don't think you'd find one like this in a new house - but maybe. This is an HDR picture from the real estate ad with your back to the corner windows. The closet is quirky but you'll need to see for yourself. Would anyone design a new bathroom like this? I think Historical Concepts would, I think Frank Neely would. ... nobody except McAlpine Tankersley. This week I started the Atlanta Glass Project devoted the appreciation of stained and leaded glass primarily in Atlanta and the state of Georgia. It's for folks who enjoy stained glass. And who doesn't? Light through even modest colored glass delights us. I want connections to expertise, history, and scholarship, to the art, the craft, and the craftspeople, to preservation and restoration. Social media should make it easier. It's a community thing; it's crowd-sourcing. I'm looking forward to your company and your contributions. Right now it's an open Facebook group. You don't have to be on Facebook to see it. To kick it off I'm made this stained glass bucket list, places to see stained glass during the remarkable Atlanta Preservation Center's 10th "The Phoenix Flies." It starts this Friday. While you are out, look for the glass the post a few pictures. There is so much more to The Phoenix Flies, three weeks of free tours including many architecture tourist favorites. Stained glass at Candler, Flat Iron, and others? Sunday March 10, 2013 1:00 pm Your picture here? Tuesday March 19, 2013 2:00 pm Your picture here? Wheat Street Baptist, Ebenezer Baptist, Big Bethel. Saturday March 23, 2013 12:00 pm Your picture here? "It also had some lavish stained-glass windows added in the 1930s when it was briefly used as a church. The glass is being restored." Your picture here? I hpe to "see" you at the Atlanta Glass Project, I'm looking forward to your contribution.